The Balfe Motorsport team has signed Jamie Derbyshire and Neil Cunningham to partner Shaun Balfe in its Saleen S7R in the FIA GT championship. Jamie Derbyshire drove the team’s Mosler in the G2 Class of the FIA GT Championship last year, while Neil Cunningham moves across from the Embassy team. “I’m over the moon!” commented the always-enthusiastic Neil Cunningham. “A drive in a proper GT1 car in international competition is something I’ve been working for throughout my career and I can’t wait to get behind the wheel of the car. Jonathan and his team have decided to take a sabbatical this season and he has been incredibly helpful in backing me to go with the Balfe squad. Warm weather testing is planned for the end of March – with the FIA GT calendar now rumoured to begin at Silverstone in early May. 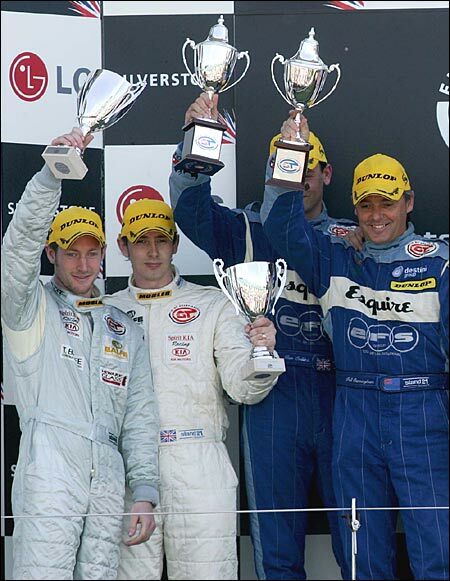 Here are the three of them on the podium - at Silverstone in May 2005 (the Mosler drivers were winners in G2 and Cunningham / Ben Collins were second in GT2, in the Embassy Porsche).